Abraham C. Myers (1811-89), QM General, CSA. Highest ranking Jewish Confederate officer. Post-war, he was a tobacco merchant in Georgia. 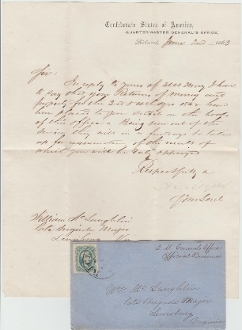 Letter Signed (LS), 1 page, 4to., Confederate States of America, Quartermaster General's Office, Richmond, June 2nd, 1863 imprint to William McLaughlin ("1st" Co. Virginia Rockbridge 1st Light Artillery) as late Brigade Major. Letter pertains to return of money and property to McLaughlin. Comes with the original postally used cover with CSA #12 stamp, postmarked Richmond, Va. and manuscript "Q.M. Generals Office, Official Business". It is addressed to Wm. McLaughlin in Lewisburg (West) Virginia.